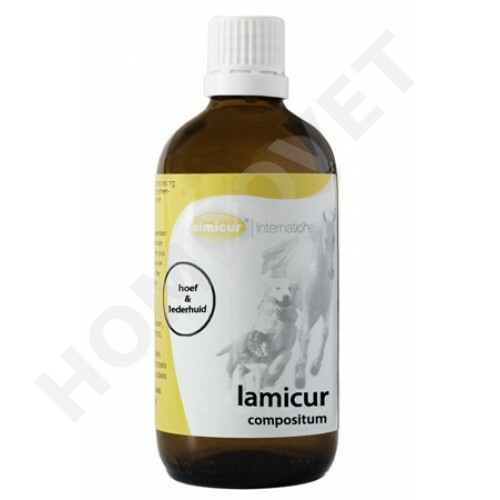 Lamicur is a homeopathic tincture in a 100 ml dropper bottle of SIMICUR for oral use in horses and ponies. Application: Administered to the feed Lamicur ensures for optimal metabolism, creating a healthy development and maintenance of hooves and hoof corium . Therefore Lamicur can be administered in inflammation of the laminae, which is accompanied by heat and stinging pains. Indications are acute laminitis and hypersensitivity to laminitis. Effect: Laminitis is inflammation of the sensitive structures in the hoof called the lamellae.The laminae are responsible for supporting the pedal bone in the hoof and thus the weight of the animal. As laminitis develops the attachment of the pedal bone to the hoof wall starts to fail, leaving the pedal bone to rotate and point towards the sole, and in the worst cases to sink right through it. The anti-inflammatory effect of arnica and the toxins removing effect of Ledum, Lamicur can be used as prevention in susceptible horses, under the condition that Lamicur is applied regularly and early. For an existing laminitis Lamicur ensures that the harmful toxins are flushed out. Notes: For horses that are sensitive to laminitis, you should give Lamicur already some weeks before the horse is going out into the pasture in the spring.